**SPECIAL ORDER** This item can take up to two weeks for delivery. 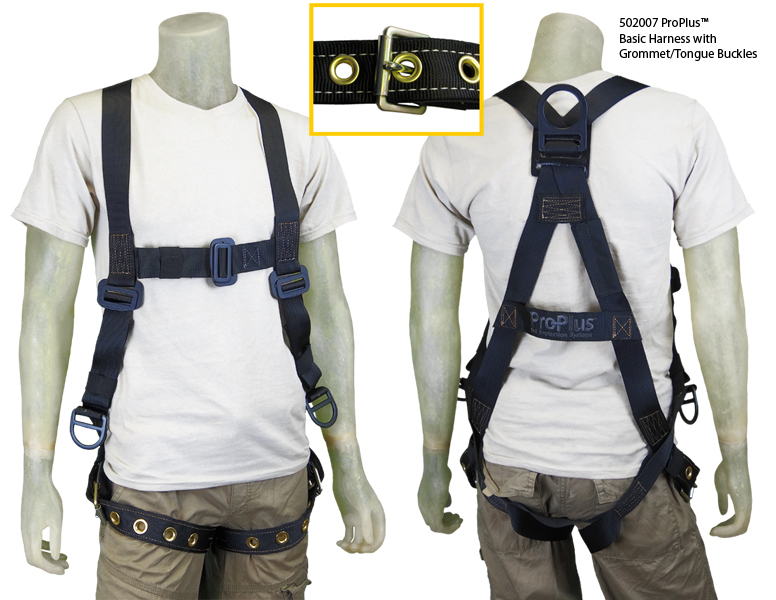 The ProPlus™ Basic harness is a general purpose, full-body fall arrest harness for use by those working at height. The Basic Harness features a 2" steel dorsal ring, allowing for SRL or lanyard attachment and rescue. This harness is ideal for everyday use in indoor and outdoor venues. Per OSHA requirements (1910.66 App C), only one snap hook or connector can be attached to a fall arrest ring (e.g. Dorsal Ring) at any one time. The optional additional dorsal D-ring is designed for those who must transfer from one fall arrest system to another. For example, a follow spot operator climbing a wire rope ladder to the truss and then transferring to a horizontal lifeline to reach the follow spots position. The Self Retracting Lifeline would clip into the additional ring leaving the dorsal ring on the harness free for the lanyard. The optional shoulder pads with D-rings are designed only for rescue. They should not be used for Fall Arrest or work positioning.